You’d be forgiven if you think we’re obsessed with broccoli and cauliflower. 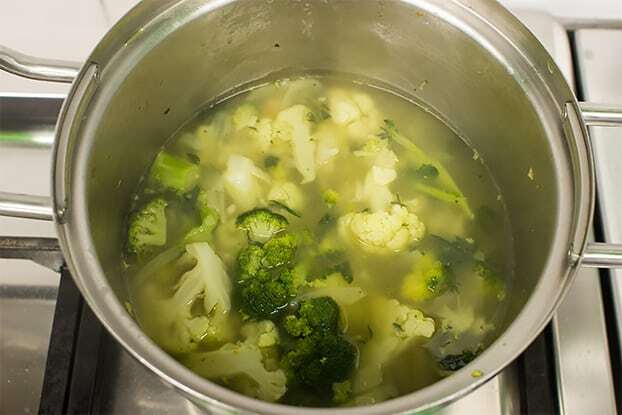 Not only do we now have broccoli and cauliflower soup, we also have a broccoli and cauliflower salad, and a roasted Mediterranean broccoli and cauliflower bake. That’s a lot of broccoli and cauliflower. And you know why? Because it rocks. It’s that simple. 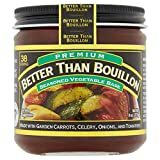 It’s tasty, it’s filling, it’s nutrient dense and it’s cheap. Superfoods get shouted about all the time. Like a z-list celebrity they rise and fall from grace; sometimes you can get hold of them, sometimes you can’t. Prices tend to stay high, however. What makes them so super, anyway? Broccoli and cauliflower don’t cause anywhere near the excitement the latest grain or berry that grows only in moonlight on the mysterious plains near the magical waterfall does, but they should. Both are cruciferous vegetables and are incredibly high in nutrients and vitamins. But we’ve talked about this before. You can find all the veggie goodness details and research right here and here. What I’m more interested in today is the cooking method. 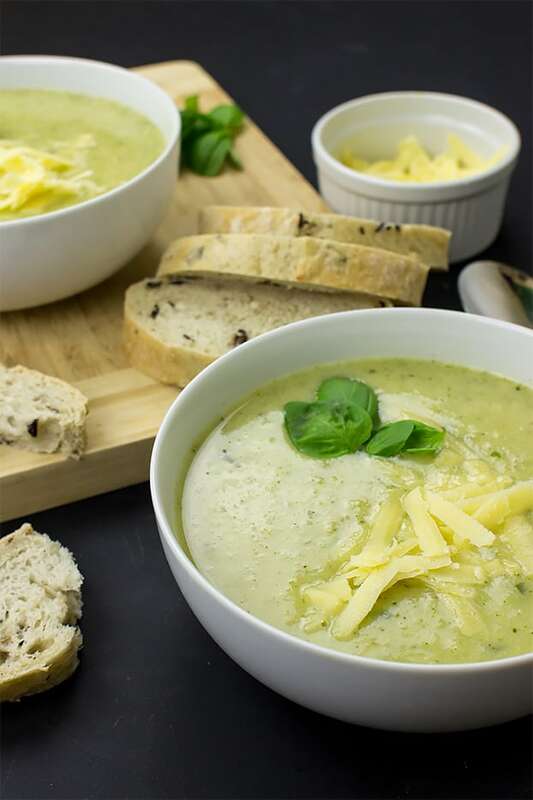 Although all forms of cooking result in some loss of vitamins within vegetables, it is generally regarded that steaming is one of the best ways to cook veg, and boiling is not. That’s mostly because the water soluble vitamins in veg will leak out into the water when boiled. Then they’ll be poured down the plughole when the veg is ready. But not if you make soup! Those lovely vitamins will be retained and eaten – by you. Pretty awesome, huh? 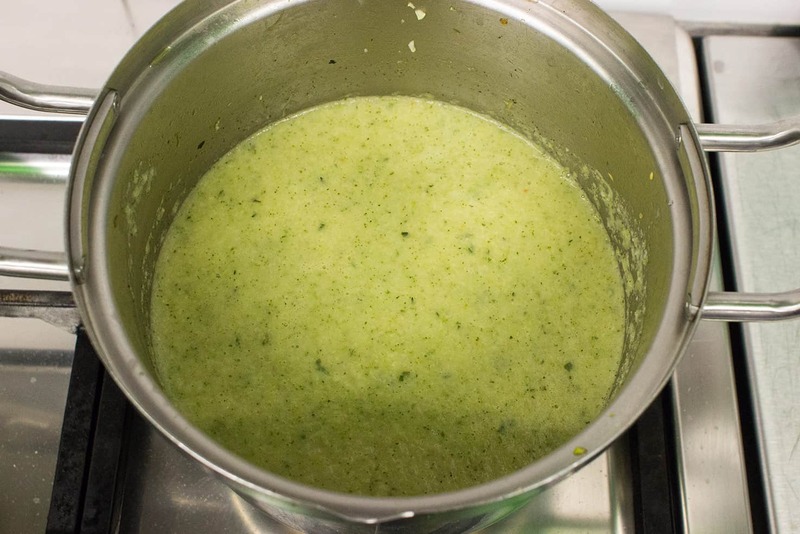 So, make broccoli and cauliflower soup and enjoy the vitamins and nutrients at their best. 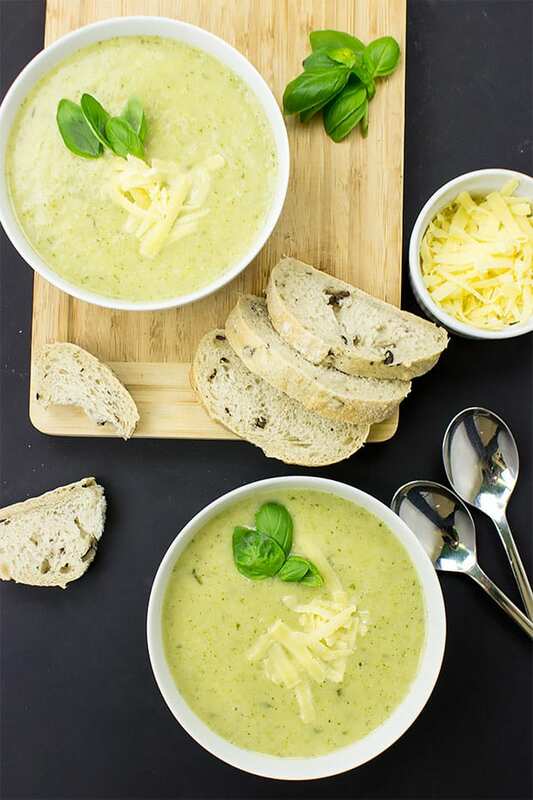 Make the most out of your veg with this Broccoli and Cauliflower Soup – tasty, easy, healthy, full of vitamins and only five mins to prep! 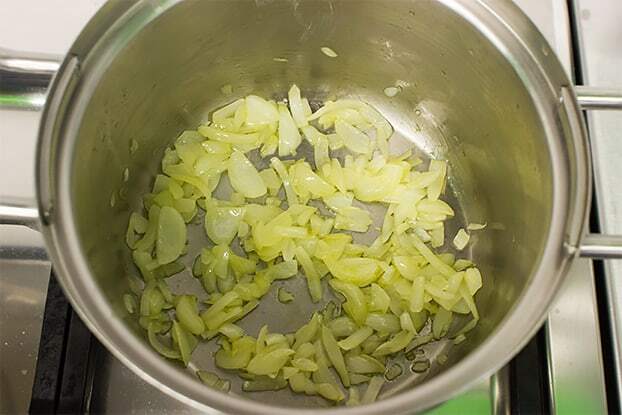 Slice the onion into rings and throw it in a big pan with the olive oil. Cook on a low-medium for 3 minutes. Chop the garlic roughly and cook for another minute. In the meantime, roughly chop the broccoli and cauliflower. Make the veggie stock as per packet instructions. 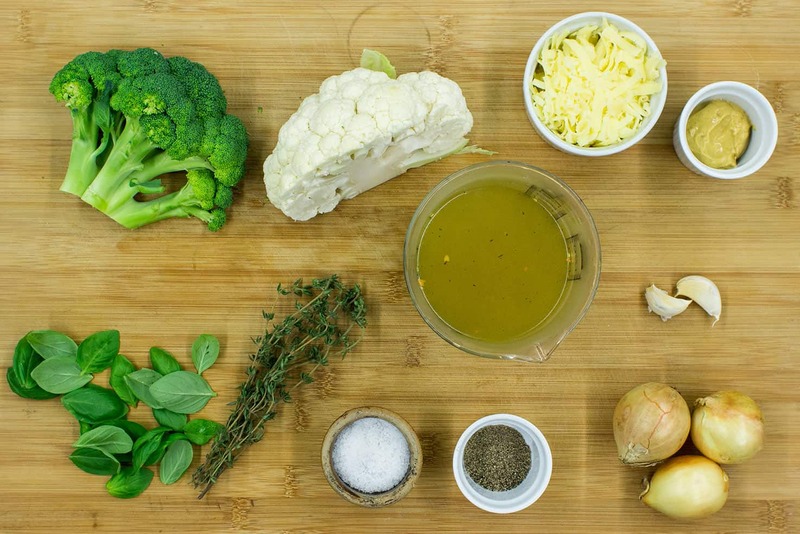 Throw the broccoli and cauliflower into the pan. Add the stock and simmer for fifteen minutes. Turn the heat off and add the cheddar cheese. Hold just a little cheddar cheese back for serving. Add the thyme, basil and mustard. Give it all a good stir and let the flavours mix together for a few minutes. Finally, use a hand blender and give it a blend! Serve with fresh bread and a few herbs of choice for garnish. Our love for broccoli doesn’t end there. Check out this awesome vegan recipe. Here’s a mega-tasty cauliflower curry recipe, too! The nutritional data used is without optional cream or cheddar cheese. We were slightly slow to announce it, but we’re happy to say we have completely relaunched the site! It was a lot of work but we’re very pleased with the results. If you’re new here then you won’t notice anything different – if you’ve been kicking around for a while then you’ll see how pretty and nice everything looks. We even have a new ‘recipe super search’ where you can choose from drop down menus to find exactly the type of meal you want from ‘vegan’ to ‘low-carb’, from ‘max 10 min’ to ‘max 45 min’ and ‘desserts’ to ‘oven recipes’. There’s so much to choose from – go have a play! Vegetables, raw or cooked in any form, are still nutritional powerhouses. Eat some, any way you like! Our site has been revamped. Go check it out! 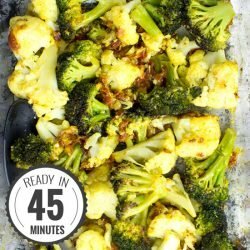 Been looking for a good solid broccoli and cauliflower recipe. 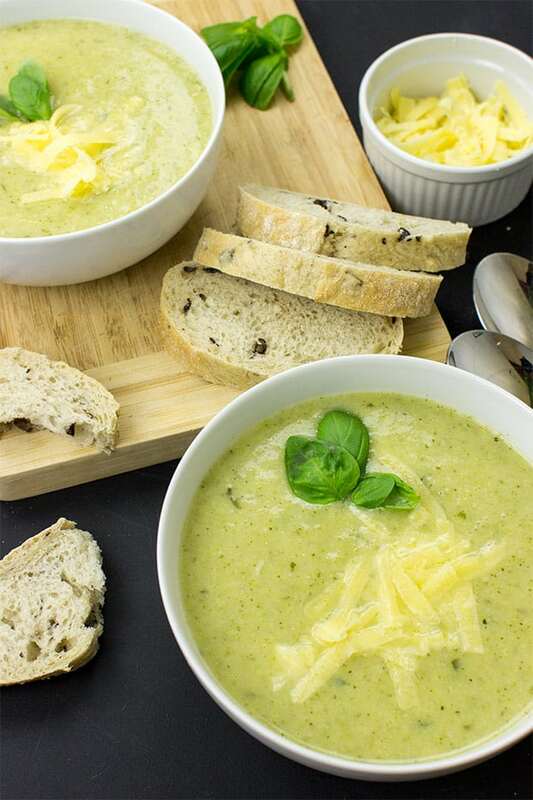 I having some leftover veggie stock from scratch to make this tonight! Nice, Billy! I bet it’s even better with the homemade stock. Enjoy!! 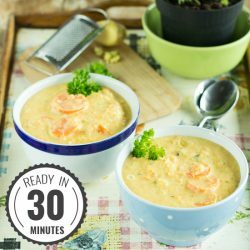 Nice flavorful soup, but subtle flavors. I did not add any salt. Thinner than I thought is was going to be. 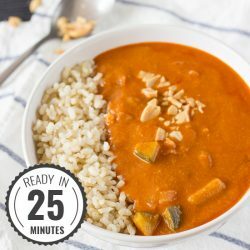 This soup is GREAT, it was quick and easy! I was in a hurry so I used a bag of frozen broccoli and a bag of frozen cauliflower. To give the soup a little kick I added some crushed red pepper flakes. The consistency was wonderful, not to thick not to thin. The family loved it. 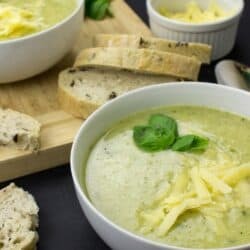 This will be my go to for broccoli soup from now on. Very happy to help, Lisa! Glad you enjoyed it so much, and the replacements sound great. We appreciate you writing, too! I liked it, but thought it needed a bit more flavor. I happened to have a small bag of dried porcini mushrooms in the pantry and about a tablespoon of goat cheese in the refrigerator. So I threw those in, gave it a stir and let it “steep” for about 20 minutes. It was perfect! Dipping a crusty piece of whole grain bread in it made it over the top. It was a little thinner than I was expecting, I also added a few extra spices and some pepper. I had it without cheese and enjoyed it – my daughter had it with cheese and she absolutely LOVED it. Hi! There are a couple of ways – the easiest is to use more veggies and less water/broth. That thickens it right up. You can also use conflour or similar. Personally I’d throw in a couple of extra veggies for extra goodness :). Hope that helps!